Our names are Doug, Lisa, and Jayden. We are touched that you are taking some time to get to know us a little bit better, and we hope to get the chance to meet you. Whether you realize it or not, you have been in our hearts and prayers for quite some time. While we are so, so eager to welcome another child into our lives, we are also so incredibly eager to welcome you into our life, if you desire. Adoption is about so much more than a baby for us. It is the joining together of many lives, including yours, to bring about the best for a child that we ALL long to see grown into an amazing person. Our prayers are with you that you find peace in whatever decision you make. We invite you to take a peek into our lives and see the love and fun that your child would have as a part of our family. 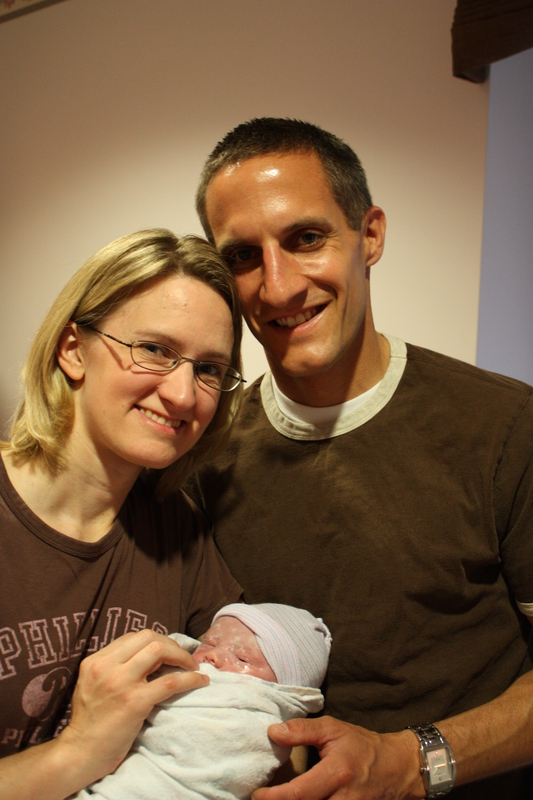 In 2011, we became parents through open adoption. Words can’t describe how thankful we continue to be for the selfless sacrifice that Jayden’s birth parents made for him. We knew from the beginning of our marriage that we wanted to be parents, but infertility interfered with those plans at first for years. We continue to be honored that Jayden’s birth family made the choice to entrust us with him. We communicate with them through visits, photos, and letters so they see the amazing and loved little boy he is. We see his birth family as an extension of our family and the story of how we became the family that you see in this book. We know the decision you are making is not an easy one. 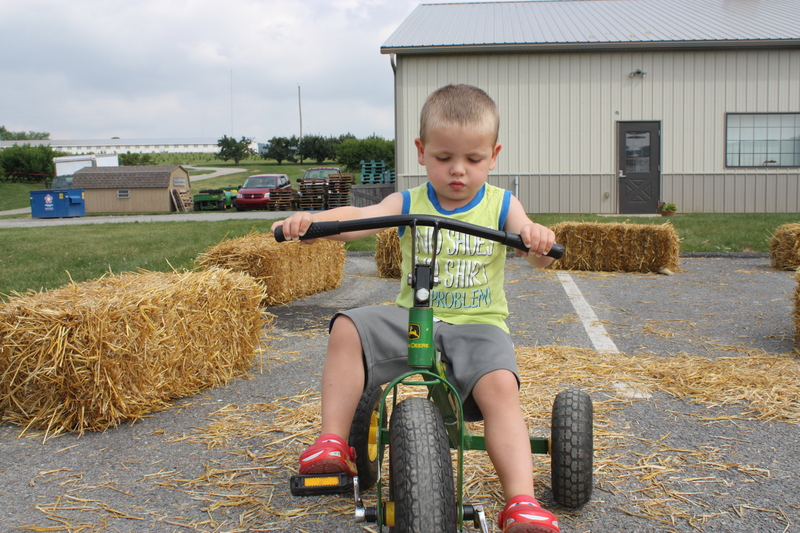 It wasn’t until we experienced Jayden’s adoption and developed a relationship with his birthmother that we were able to see the extreme love that you are feeling to be considering adoption. You are courageous and we thank you for taking this important step. We LOVE the hard work of being parents and hope Jayden will someday get to show off what a great big brother he can be. We absolutely can’t wait to welcome another baby to love! 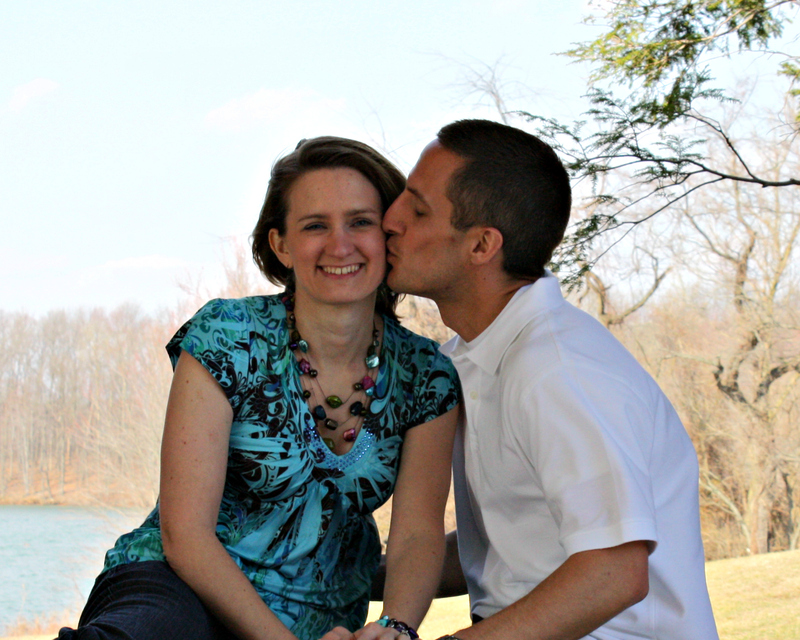 Doug and Lisa: We met through a mutual friend and went on our first date a week later to dinner and a movie. All it took was a few lively discussions about basketball tournaments, our rival high schools, and shared experiences working at different middle schools for us to be inseparable after that first date! Doug couldn’t even wait 24 hours before calling Lisa back again to go for a walk on a warm, early spring afternoon! We got married two years later, knowing that our lives would be filled with children, travel experiences, and happiness. While we still enjoy having the occasional date night out for dinner, chocolate-tasting or catching a movie, our happiest times are just time spent together as a family. As a family of three, we love exploring through travel. Jayden has become a great car traveler, and we can’t wait to start taking him and a sibling on longer trips involving planes or trains (maybe Disney World and Mickey Mouse!). We enjoy spending time at the beach with extended family. We live close to several large cities, so adventures are only a quick car ride away! 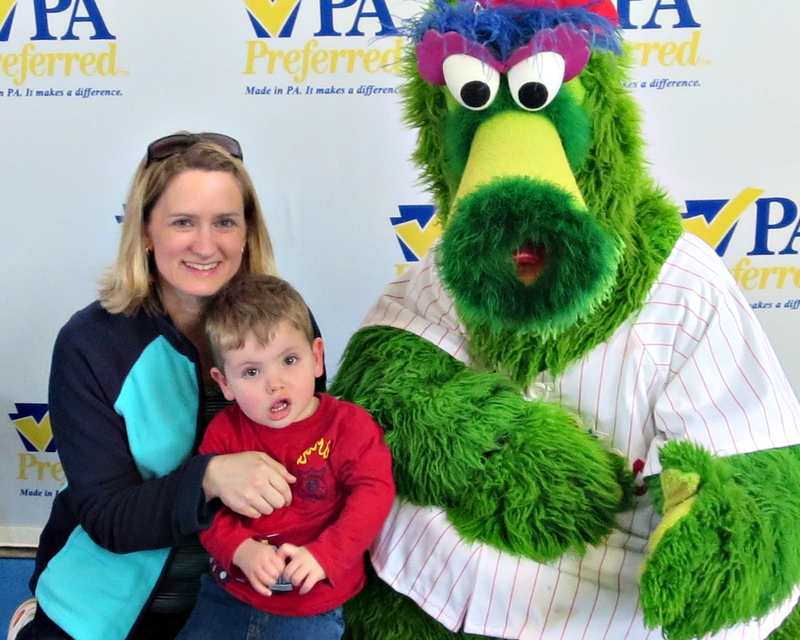 We are huge Philadelphia Phillies fans and just took Jayden to his first home game, which he loved! 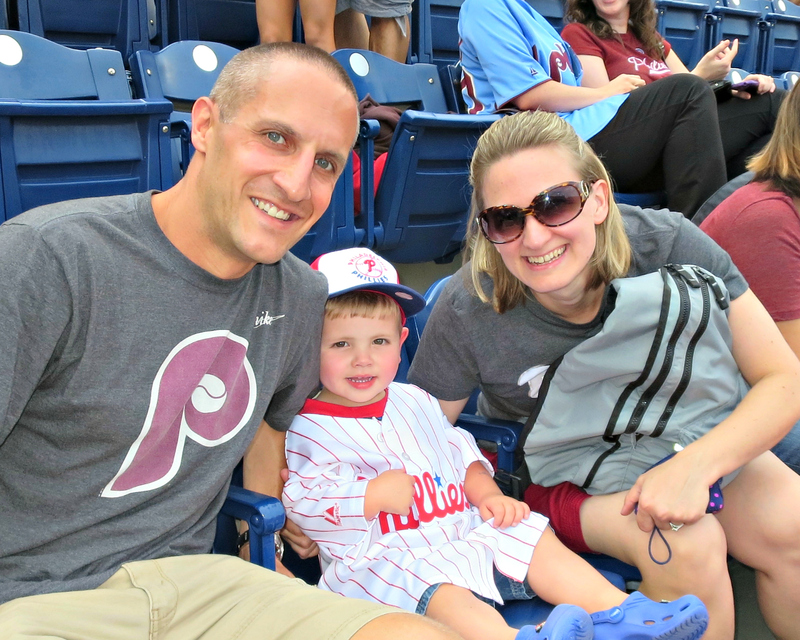 Before we had Jayden, we made the goal for ourselves to visit the Phillies in every stadium in the country. We can’t wait to continue this adventure with Jayden and a second child because it makes for such great travel adventures! We also love spending time together at home. Depending on the season, you might find us in the garden or shove ling snow, kicking a soccer ball or picking apples. And every night we eat dinner together, something very important to us. 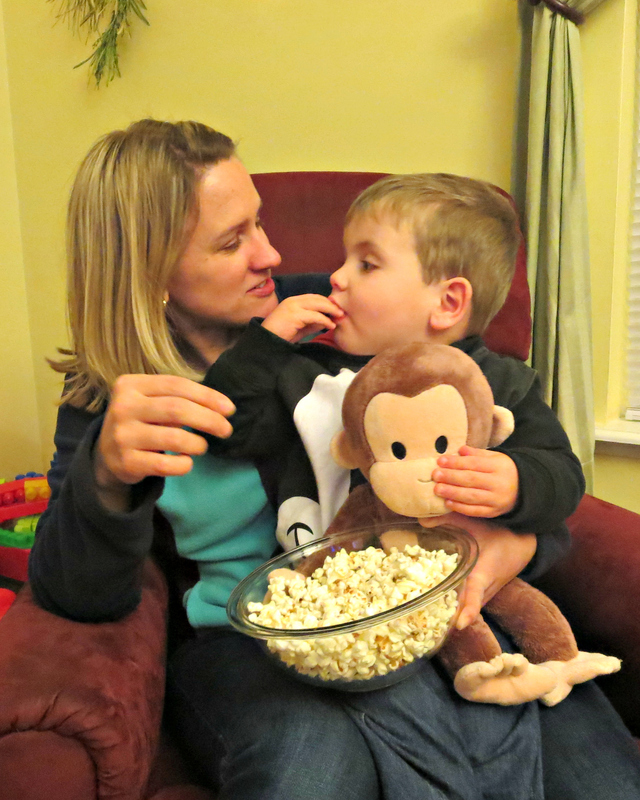 We have recently begun Family Movie Night Fridays where we pile pillows and blankets on the living room floor, eat popcorn, and watch a Disney movie together. Being members of our church is another important thing for us. Together, we have taught Sunday school to middle school kids and were brave enough to accompany a group of high school students on a trip to San Antonio, Texas, when we worked with the youth group. Now, as parents, we are part of a Sunday school class with parents of young children. These young kiddos are definitely going to have plenty of escapades together as they get older! We intend on having his brother or sister baptized at this church too, and know that he or she will get lots of snuggles during that Sunday School hour! Getting together with friends and family is so important to us. We love celebrating the holidays with our family, making sure that everyone gets their chance to spoil Jayden! Jayden was warmly welcomed into our lives by so many extended family and friends, and those same people are so excited about welcoming a sibling for him (and spoiling that brother or sister, too!). We are so excited about becoming a family of four and including a new little one in all of our fun activities that we already enjoy. 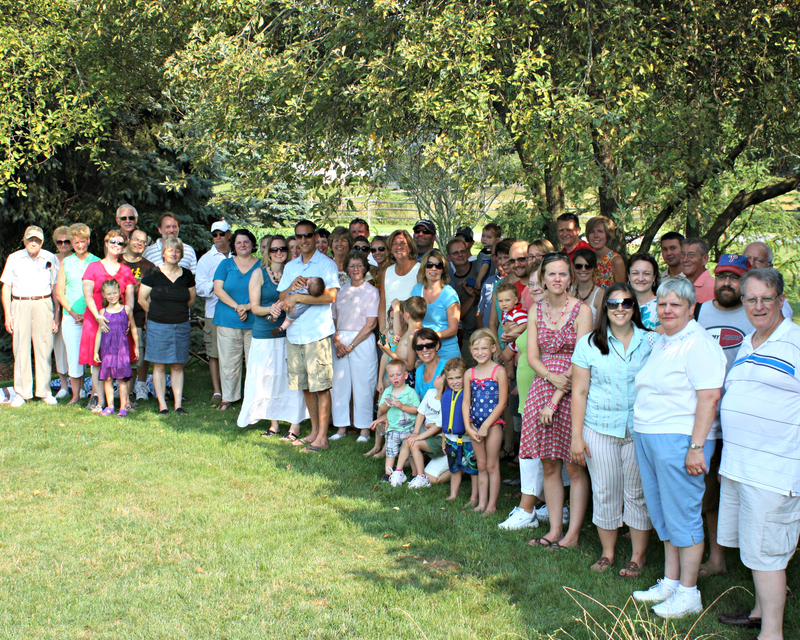 So many came to welcome Jayden on a very warm July afternoon! About Lisa: My childhood was spent playing with my sister outside during the summers. We dreamt up imaginative scenarios to play out in our yard with our neighbor friends. My parents just celebrated their 40th anniversary and are great models for a healthy marriage. As parents, they were supportive of what my heart desired, and i want that to be true with my children. 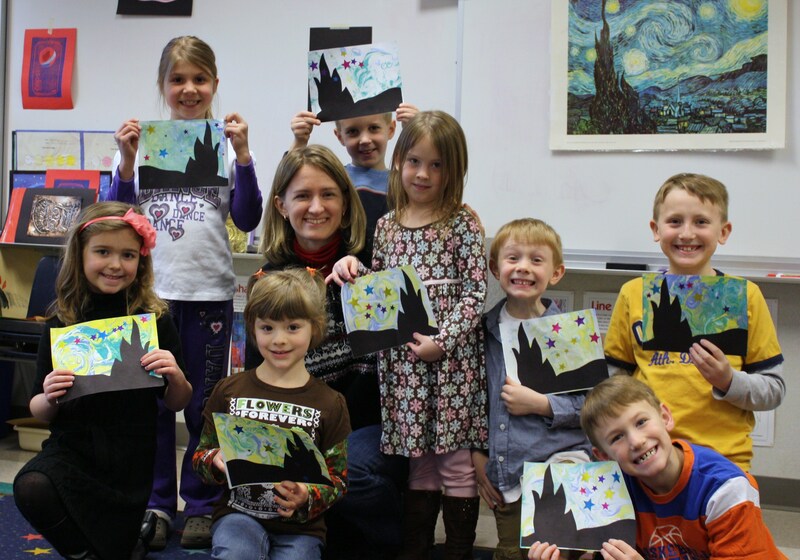 I am an elementary art teacher and seeing my students’ love for creating is a wonderful part of my life. Although I really enjoy my time with students during the school day, Jayden and my family are my real love. I jumped at the chance to move from full-time to part-time teaching so that our family time would be more meaningful. I love having the extra time at home with Jayden. With the adoption of a second child, I hope to spend time away from teaching to be with our children, and I’m so thankful that, when I must return to work, it can be part-time. Being a mother is one of the most fulfilling things of my life. While it is not without it ups and downs, nothing compares to getting to run around at the park with Jayden, squishing Play-doh with him, and tickling him until he erupts into his infectious giggles. When a brother or sister arrives for Jayden, I can’t wait to find our own special things to do together as a mother and child, and look forward to seeing the great big brother that I know Jayden will be. If being a mother is one of the best things of my life, watching Doug being a father rates up there as a close second. Doug is so great when they play together. I know that when he comes home from work, his priority is spending time having fun with Jayden. While I might engage in quiet play with Jayden, Doug is great at running around with Jayden and getting all of that little boy energy going. Jayden loves his daddy and I can’t wait to see another little one around for Doug to run around with! About Doug: I grew up with very loving parents and a younger brother that I could horse-around with. My parents were very supportive of the things I wanted to do when I was younger, allowing me to explore a variety of sports and do some traveling to Europe when I grew older. Today, running is a great way for me to clear my head and make me a better father and husband. 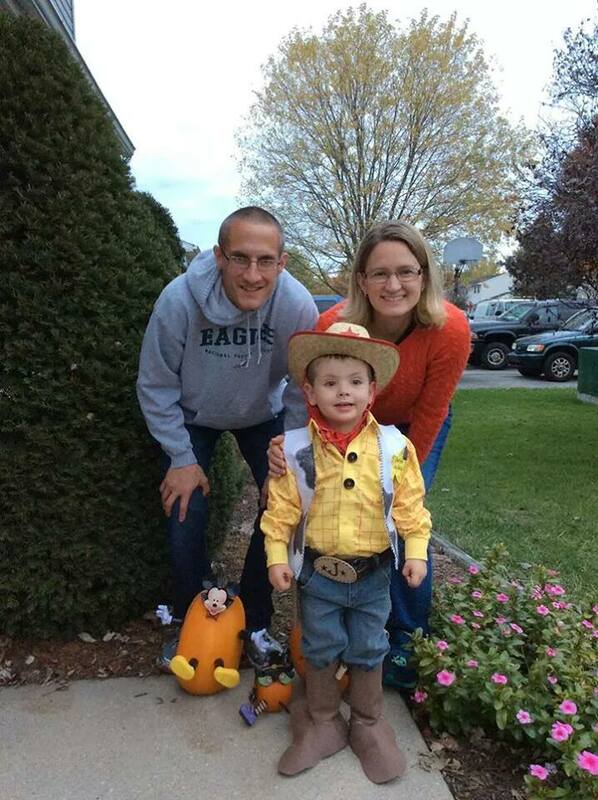 I have run in various running events over the last several years and love having Jayden and Lisa come cheer me on. When it is warm out, Jayden loves coming with me in the jog stroller on the nearby rail trail! My father passed away when I was in high school, so spending time as a father now with my own child and family has become especially meaningful. I work with middle school students as a school counselor in what can be a very difficult time in their lives. I love my job. The days are never the same and the challenges always keep me on my feet. Despite how much I enjoy my job, nothing compares to the joy of being a dad. And with both of us working in schools, summertime is especially meaningful because of all of the time we get to have together. I love being a father because of the fun growth I get to see in Jayden. Just being a part of shaping his life and watching him grow up makes my life feel meaningful. It is not only seeing the smile on Jayden’s face while playing, but seeing that same smile when I get to teach him about new things, like dinosaurs. 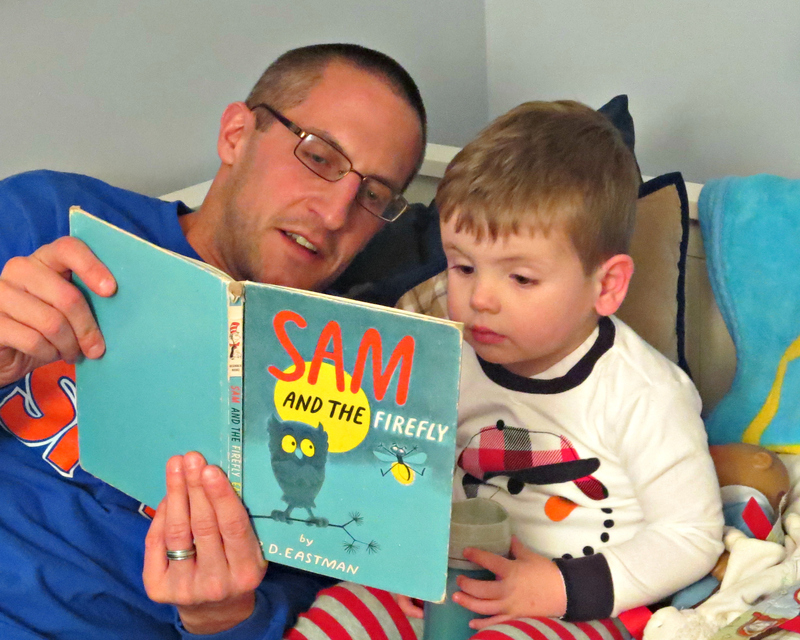 One of my favorite times of the day with Jayden is bedtime, where we get to slow down and read books together. I can’t wait to share these times with a sibling for Jayden! Getting to watch Lisa be a mother is incredibly gratifying. She will do anything for Jayden, and it shows in her actions. Her attention to all of Jayden’s needs, even if there may be something else she may want to be doing, is truly inspirational. The way that Jayden looks for Mommy whenever he gets the chance, shows just how much he loves Lisa, and how much she loves him. About Jayden: From the time Jayden was a little baby, many people commented that he was 100% B-O-Y, and they are right! He has a huge amount of playful energy, yet a huge heart, too. He loves playing with his trains, watching fire trucks, reading books, driving trucks through the sand, and spending time with his grandparents. He is so “at home” outside and playing. He can’t wait until the sidewalks are cleared in the spring so that he can ride on any of his wheels-bike, scooter, or skates. Jayden loves helping in the kitchen, too. 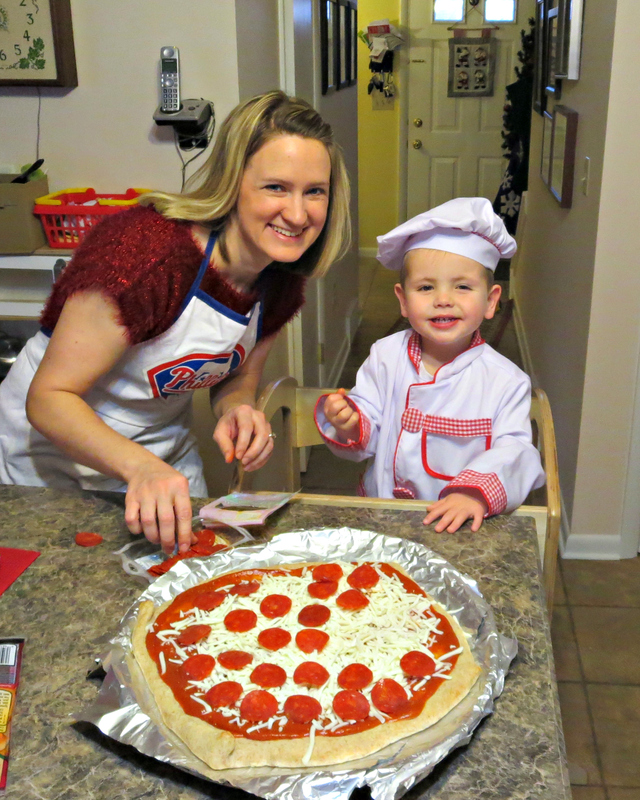 Recently, he was able to help make our traditional Christmas Eve homemade pizza dinner, and we loved making it together! Jayden loves socializing and spending time with his friends. He always comes home from preschool with stories about “playing bugs” with one friend or singing songs with another friend. Jayden loves spending time with our extended family and friends. He gets excited when he knows we are making another quick trip to see Grandma and Grandpa, or Nana and PopPop. Jayden is loving and affectionate. We know that he will make a great older brother and teach a little brother or sister all about the different trains he knows and the right way to stand when you are trying to learn to roller skate! We met Jayden’s birthmother early in her pregnancy and were lucky to be at an appointment, ultrasound, and later, at Jayden’s birth. It is important to us that Jayden knows how loving she is. Already, at a young age, Jayden can point out pictures of her in a special book that we made just for him about being adopted and how special she is. We hosted Jayden’s birth family this past Christmas season for a gingerbread decorating date. My heart was so full at the end of the afternoon seeing Jayden get to love and be loved by this side of our family! We want those same kinds of experiences with a second child and his or her birth family, if those are the family’s wishes. 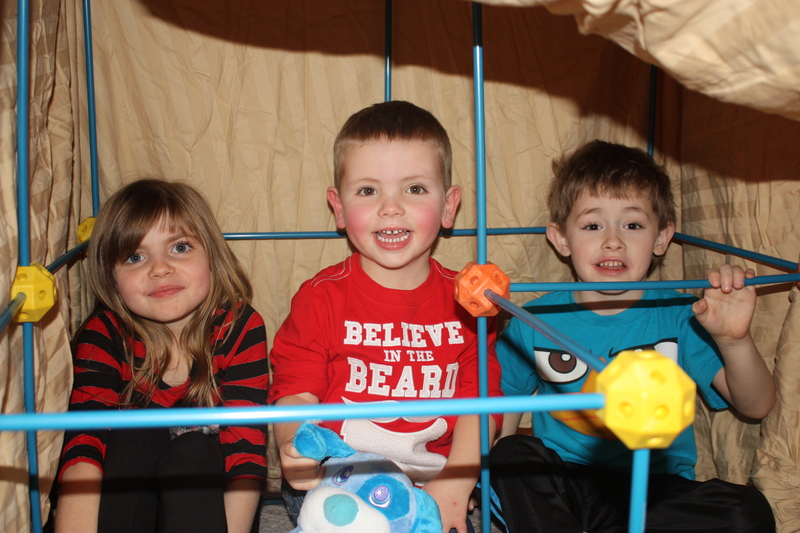 Jayden and his birth siblings sitting in their fort that they build with his birth father. Adoption…has been the best experience we have had together as a family. We never dreamed how much we could fall in love with a little boy and can’t wait to “complete our family” and fall in love all over again with another little baby boy or girl. We are committed to loving, caring, cherishing, guiding, and parenting this child to grow up to have the most fulfilling and meaningful life we can possibly provide. We are open to keeping the level of contact with you in a way you are most comfortable with, whether it is letters, emails, pictures, or visits. We are humbled by your journey and thank you for taking the time to consider us to be the family you select. You will continue to be in our thoughts and prayers as you make this challenging decision and sift through all of the possibilities for your child.